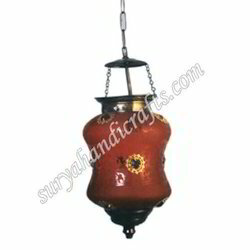 Prominent & Leading Supplier and Manufacturer from Jaipur, we offer Glass and Antique Lamp such as Glass Mojic Laltan With Stand, Glass Malti Lamp, Glass Lamp, Glass Mojic Lamp, Mojic Glass Lamp, Glass Mojic Malti Lamp With Table Stand and many more items. Lamp choices offered provide for superior decorative and functional attributes with its alluring pattern, fantastic looks and color combinations used making them all the more wanting. Coming in enticing pattern combinations, these lamps reflect traditional Indian craftsmanship and provide for artistic touch to the interiors of homes. Some of its features include classy look and attractive designs, meeting the requirements, tastes & preferences of customers, provide for artistic brilliance and aesthetic appeal, exclusively crafted finish, provide suitable use at different interior spaces for decor purposes.